Red River Real Estate and Vacation Rentals - Little Fanny, Red River, New Mexico. Little Fanny is a great home that is located just a stone throw from the Red River and is located on the west end of Red River, New Mexico. This home has just been recently upgraded with all new furniture, flooring, counter tops, etc. We love our pets and we know that you do to! Little Fanny is pet friendly, please contact our office staff for any questions or pricing! When you walk up the steps and enter the cabin you will be standing in the living room. 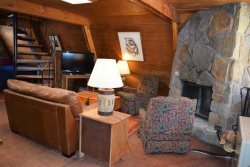 Here you will have the ease of a gas log fireplace, and above that is the large flat screen TV with a DVD player giving guests the option of watching satellite or movies brought from home. The living room also has a sleeper sofa that can be pulled out to make a double bed. Walking past the living room you will find the dining table and the kitchen. The kitchen has plenty of counter space and cabinet space to store things brought into the home. There is a half bath located off the kitchen for guest access. The appliances are all new and all stainless steel. Guests that choose to stay in the Little Fanny are able to enjoy amenities such as a gas BBQ grill(gas cylinder provided, courtesy of Red River Real Estate) that can be found on the front deck. This home has a large deck that has outdoor seating that is covered over head. Both of the bedrooms that Little Fanny has to offer are located upstairs. The first bedroom is equipped with a king bed, a flat screen TV, a private balcony, and access to the hallway full bathroom. The second bedroom has a queen bed, a flat screen TV. Little Fanny is walking distance to the Red River Ski and Summer Area making this a favorite cabin for anyone looking to be in a free standing home that is very close to activities such as skiing, snowboarding, and the new zip line that has been added courtesy of the Red River Ski and Summer Area. Guests that stay here area only a block away from Main Street. Little Fanny does not provide WiFi. Two bedrooms, one and a half bathrooms. Little Fanny provides satellite, and a gas BBQ grill. Little Fanny pet policy: Pet friendly! We were very appreciative of the road closing warnings that you gave us throughout our stay. It was a road we would have traveled and do appreciate the extra time you took to provide the updates and keep us posted to the travel conditions. Our stay was lovely and very relaxing. We come to Red River to get away from the rush of the city and the heat in Texas and enjoy the majestic beauty found in the mountains. The local people of Red River always make us feel welcome and that is much appreciated on our part. I have personally been coming to Red River since I was a teenager, years ago and never tire of the beauty of the area or the town itself. It is a great place for families to get together. We enjoyed working with you and look forward to returning in the future. Check in team was awesome. Friendly and made us feel welcome. Staff was very friendly and knowledgeable. We were in and out of the office in a flash! Cabin was great! We loved sitting on the deck in the evening to view the mountains. A couple of evenings had deer close by grazing. Loved the house would stay there again in the future. Cozy cabin close to town. Perfect location. Spectacular views of the slopes.